For a lot of people, black widows inspire fear, but to me they are friends with amazing habits and shy, unaggressive* natures. Check out Chris Buddle’s post over on Expiscor for a conversation about these beautiful, misunderstood spiders! *In my experience, black widows are not aggressive towards humans. With potential prey (various arthropods including other spiders), of course, it’s an entirely different story! 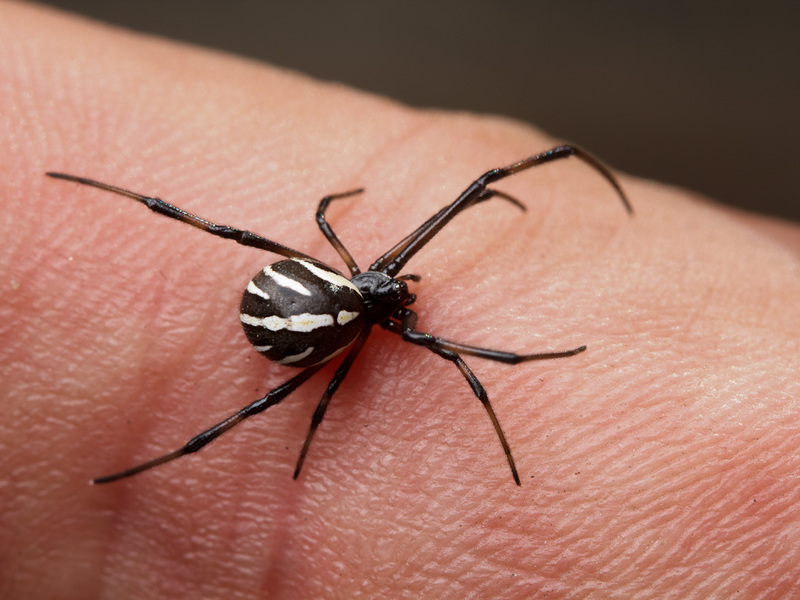 This entry was posted in spider myth-busting and tagged behaviour, black widows, Latrodectus by cataranea. Bookmark the permalink. How often do juveniles look like that? With white on them? The colouration of juveniles is highly variable but they usually have lighter colours and white markings. Thanks for commenting! I have a many spiders with the exact design as the one displayed in the picture above, but they do not have hour glasses. I believe they do have a small splotch of white on the bottom of their abdomens though. Is it possible that some don’t have hour glasses? Also, what does the web structure look like? The ones in my back yard weave blanket like webs that they hang upside down on. They also don’t take shelter during the day. Please E-mail me the answers when you have time. If you have a suggestion of what spider this may be, if not a black widow, please share! Thank you so much for posting this. I found a black and white -no hourglass widow on my bleeding hearts outside in Alaska. Google does not float a lot of good information about black and white widow *spiders*. Black widows typically aren’t found here, let alone content outside. The webbing incorporated a lot of cottonwood seeds which gave the appearance of thick webbing strands. I never knew this coloration was an option.